So, we promised in our last blog that we would go off the beaten track and planned a route to Laos which would give us an unadulterated look at the ‘real’ Cambodia. And that’s exactly what we did! We got up at 5.45am in our Siem Reap hotel and were met by a minibus at 6.30am. He took us to the Neak Krorhorm bus office where we had to sit on little stools for half an hour and wait for a big bus to take us to the bus station. At the bus station we were put onto another ‘big’ bus filled with Cambodians – we were the only foreigners on the entire bus. Yes, this is it, we thought, finally going ‘local’! – although we suspected that we had still paid more for our tickets than the rest of the people on board. The bus was driven by a really rude man who for some reason wore his shirt half rolled up (not a good look with his belly) and who just said “I don’t know and I don’t care” in broken English when asked a question. He stopped around 3 times on the way to Kampong Cham, which made the journey about two hours longer than it should have been, but at least gave us a chance to buy some lunch, as the dried-up egg sandwich the hotel gave us went straight out the window! We ended up having some really tasty fried rice at a roadside café –something we weren’t expecting as the smells coming out of the kitchen weren’t particularly appetising! 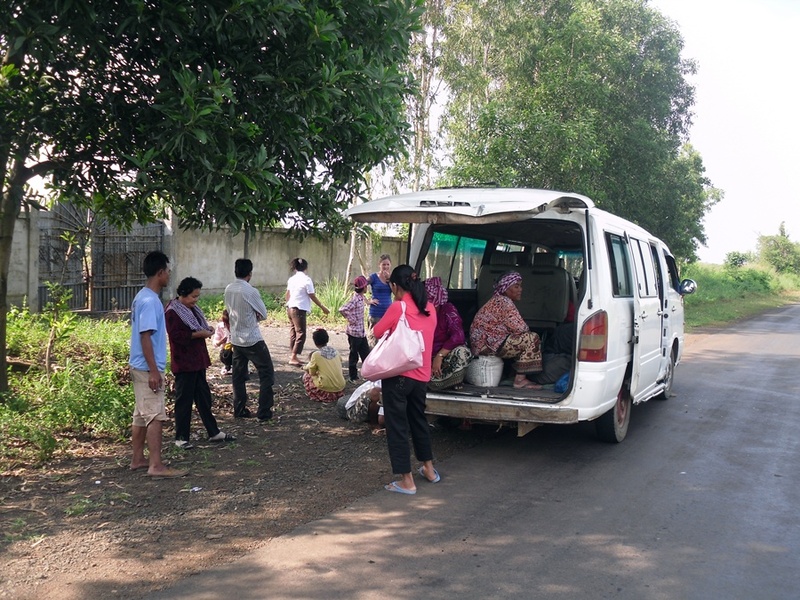 When we got to Kampong Cham, everybody got off the bus except us and 5 or 6 other people. 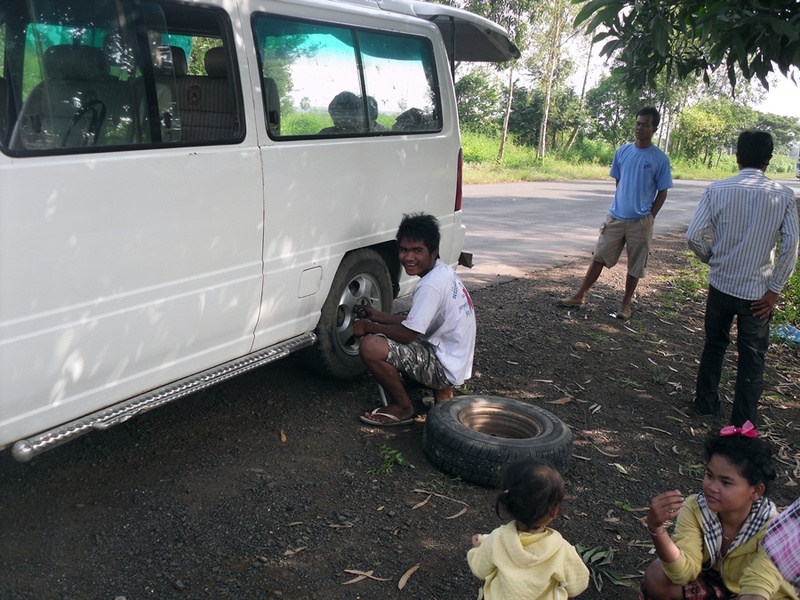 We were told that as we were going to Kratie we had to get a different bus about 30km down the road. When the bus stopped again we were quite confused to see a beaten up old minivan (this transpired to be a shared taxi) waiting for us. Some guy with a hat on took our tickets, threw our backpacks into the back of the van (on top of the dirty spare wheel) and told us to get in as this would take us to Kratie! We both looked at each other, wondering what we’d let ourselves in for and began pining for those big, comfy air-conditioned buses we usually take! So in we climbed and squeezed ourselves into the back seat along with another man, closely followed by the 5 or 6 people who had stayed on the bus with us! Bearing in mind that this minivan had just 8 seats, we weren’t anticipating a smooth ride. Our fears were confirmed when the young lad driving the van stopped several times to let even more people in! We ended up with 13 people and a baby all crammed into this one, ridiculously small vehicle – 3 of whom were sat in the back on top of our two bags and the wheel! One advantage of this mode of transport however was that we knew we would get to Kratie in record time – much quicker than a coach would have taken, especially since the driver was racing along at break-neck speed listening to Cambodian dance music with far too much bass! 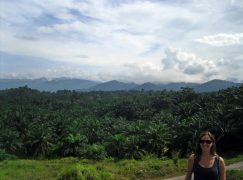 This was the first time we felt like real ‘adventurers’ here – bumping around in the back of a beaten up van, through villages, over bridges and past amazing rural landscapes. There was no air con so the wind was just flying in through the windows and the trip was actually quite exciting! Halfway along a dusty dirt track however, we were slowed down with a bang as a loud, unhealthy sound suddenly burst from one of the wheels. 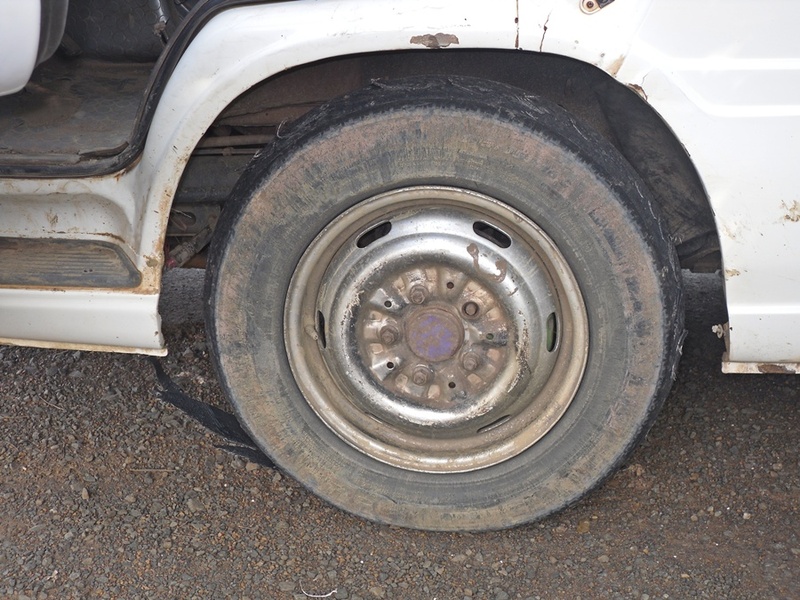 We could hear something flapping around and at first thought that the tyre had blown (if so we were very impressed that the driver managed to stay on the road!). However, this proved not to be the case as the driver got a hand saw out from behind the seat, went round to the front of the van and started to hack something off before leaving it in the street and driving off again slowly. We turned around to see what it was and realised that it was a wheel nut and piece of tyre! A few yards down the road, we ground to a halt again and the driver got out, this time, getting the spare wheel out of the back. Everybody piled out of the van – it was far too hot to stay in there, plus the driver started jacking it up so we thought we’d better move! Once we had a look at what the problem was we just had to get the camera out! The front tyre tread had completely disintegrated and huge chunks of it were hanging off. Turns out that the tyre was a re-mould and the glue holding on the tread had obviously worn off. The wheel was swapped with the back one, which was then replaced with the spare one and we were back on our way again! Nobody else seemed particularly phased by the state of our transport and seemed to all take it in their stride, so we thought that we’d better just go with the flow and climb back in! Our ‘taxi’ went on its merry way, dropping off individual passengers in various villages hidden away from the main road. Whilst it took a bit longer this way, it was great for us as we got to see where people actually lived. The villages were just what you’d expect – people sitting out by the roadside with tables of fruit for sale, washing their clothes in buckets with loads of kids running around playing. The roads around these parts were a nightmare of course, but again, this all added to the experience! Once we arrived in Kratie the minivan stopped outside a petrol station and told us that we had ‘arrived’. We hadn’t arrived at the bus station like Neak Krokhorm told us of course, but were just left standing by a petrol station with no idea what end of town we were in or where the hotel was! After about 15 minutes of wandering around we found it, right opposite the Mekong River, and checked in. The Balcony Guesthouse is run by an old Aussie man who sat with us while we were having dinner, drinking beer and telling us how he much preferred living in Cambodia than Australia. He told us that he could book us tickets to Lao for the next morning with the bus company he usually uses. The price seemed a bit steep – 14$ each – but we were so tired and Kratie was so empty and devoid of travel agents so we booked them, had some food and went to bed at 9.55 – one of our earliest bed times yet! The next morning, we got up (again at 5.45am), had some bacon butties, paid our bill and waited for the bus to collect us. We asked for the bus tickets several times but the staff at the guesthouse kept saying that we didn’t need them. That, in our experience, is a complete lie as you ALWAYS need proof that you’ve paid for something like this, but still, nobody had a ticket to give us. 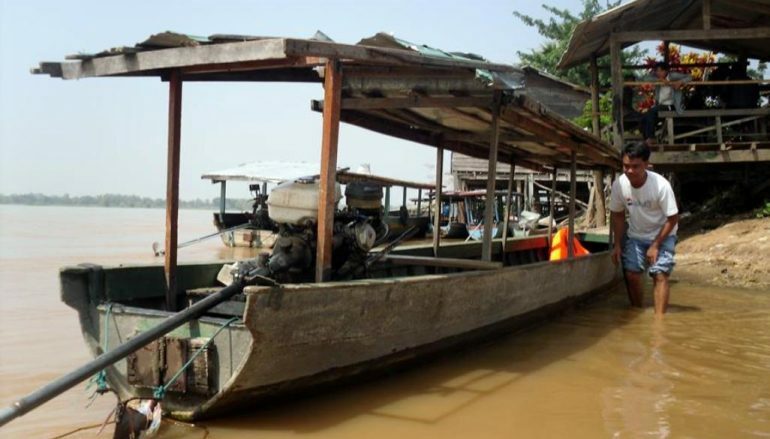 They insisted that it would be fine and that all persons involved in our transit to Lao and 4000 islands knew that we had paid. We waited outside and a few minutes later a minivan came roaring towards us honking its horn repeatedly. Oh dear, here we go again, our ‘bus’ is yet another shared taxi – seems to be the way they do things around here. But considering that we actually had quite a laugh the day before, we thought it couldn’t be that bad! So the driver got out, grabbed our backpacks and threw them into the ‘boot’. I say ‘boot’ because the space wasn’t big enough for a handbag, let alone our backpacks and we kept cringing at the sound of our bags squelching and rustling every time he tried to slam the boot door shut! Anyway, we set off, again at lightening speed and after a few minutes a young girl got into the minivan, followed by another young girl, then a man, then two more men, then three women with suitcases until there were 15 people crammed inside! No baby this time, just 13 extra adults, including one squeezed into the drivers seat, while the driver practically sat on his lap to reach the pedals and a woman who looked like she was about to die kept throwing up into a plastic bag beside me! Now, if we’d have paid the same price as the one yesterday we wouldn’t have minded this debacle, but the fact that we’d paid twice as much after the guesthouse owner said he only used the ‘best’ bus companies, really annoyed us! The driver was a complete maniac and kept his hand on the horn continuously, even when there were no other vehicles in front – I swear I’ll be hearing that horn in my sleep! We rattled over dirt tracks and metal bridges for two hours, through villages situated on the edge of the Mekong until the van pulled up beside a big coach which was parked at the side of the road. The driver motioned for us to get out and we were met by a young lad who told us that we would be going the rest of the way with them! Slightly confused we walked over to the bus and realised that it was a good ol’ fashioned Paramount Bus – the same company we’d been using throughout Cambodia! 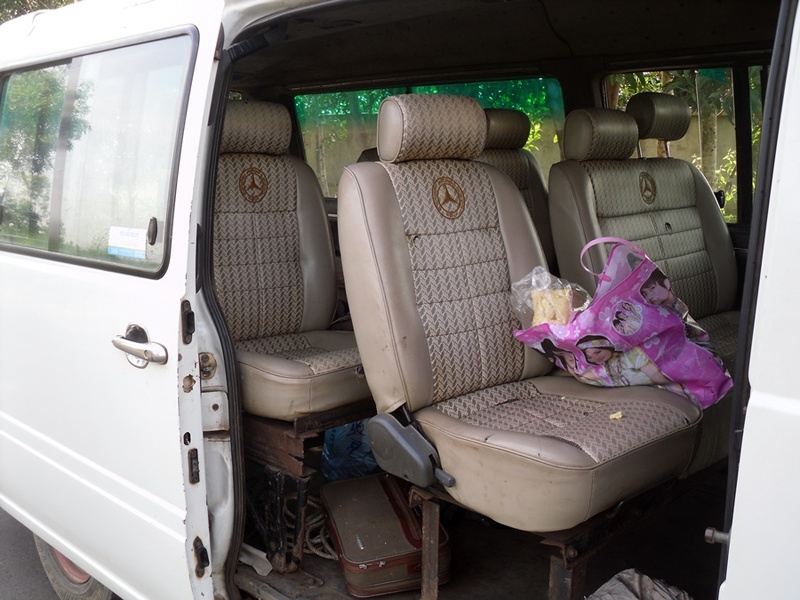 We got on board to find that there was only one other passenger on the entire bus – an Aussie girl who was on her way to Pakse. She was quite relieved to see us also, as she had been the only one on there since she left Phnom Pehn that morning. Our journey got even more bizarre when two of the lads who worked for the bus company put on some music videos, switched on a microphone and proceeded to sing their hearts out to Cambodian love ballads – taking in turns to sing each song. They were completely tone-deaf and the speakers kept crackling because they had it up so loud but we couldn’t help laughing and had to take a video, just so you guys could sample some of what we had to go through! About an hour later, we rolled up to the Laos border and asked the guys on the bus where we had to go to get the rest of the way to 4000 Islands. We were slightly concerned about the fact that we didn’t have any tickets but everybody kept insisting that it would be fine. So we walked up to the Cambodian border office and got stamped out – they charged us 1$ each to put the stamp in our passports, something which we were fully expecting but that they really shouldn’t charge for at all! 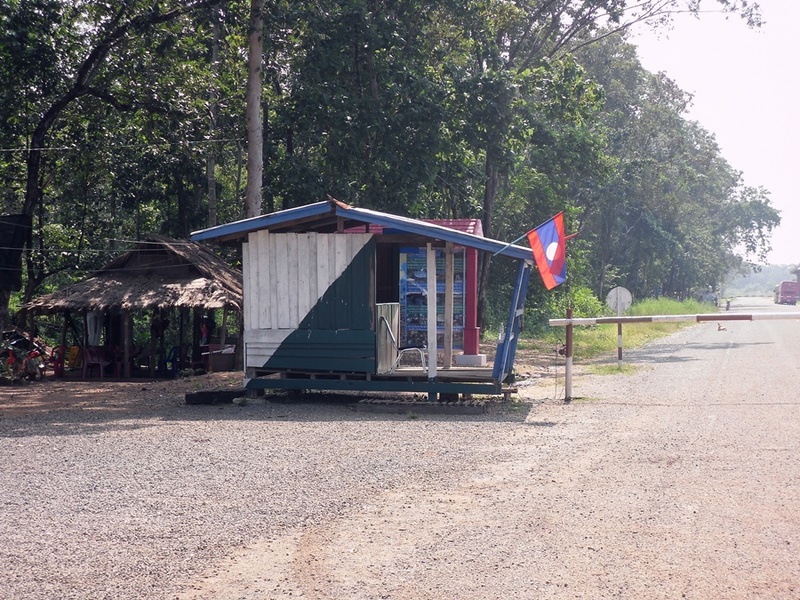 We then walked across a dirt track to the Laos customs office – i.e. a wooden hut with two men sat in it. They took our passports and charged us 2$ each to stamp us in. Apparently that was ‘weekend rates’ so we just handed it over and told them to enjoy their beers. 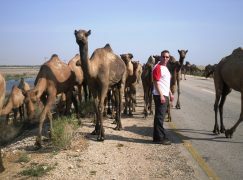 We also got the answer to the question of whether or not visas on arrival are available at this border – yes they are! There is a window at the end of the hut which says ‘Visa on Arrival’ HOWEVER, when we went the window was shut! So our advice to anyone using this overland border (Dom Kralor) in future would still be to get your visa in advance. On the other side of the barriers was a minibus with the words Pakse and 4000 Islands on it, so we got in and spread out as there was still only us and the Aussie on board. The driver then asked us for our tickets – here we go, we thought, we knew this would be a problem! After about 5 minutes of explaining to him and the other guy who worked on the previous bus that we didn’t have the tickets, they finally just decided to take us and promised that the person who ran the boat to Don Khon – the island we were going to – knew that we had already paid. It didn’t take us long to get to the boats so when we arrived we said goodbye & good luck to our Aussie friend and walked down to the riverside. Everybody kept asking us for our tickets but we just kept saying that we’d given them to someone else and after a while they just gave up and let us go on our way. We got onto a long, unstable looking wooden boat with four other people heading to Don Khon – it rocked every time someone moved and we were slightly concerned that it would tip over! All was fine however and we could just sit back and enjoy the trip to the island. 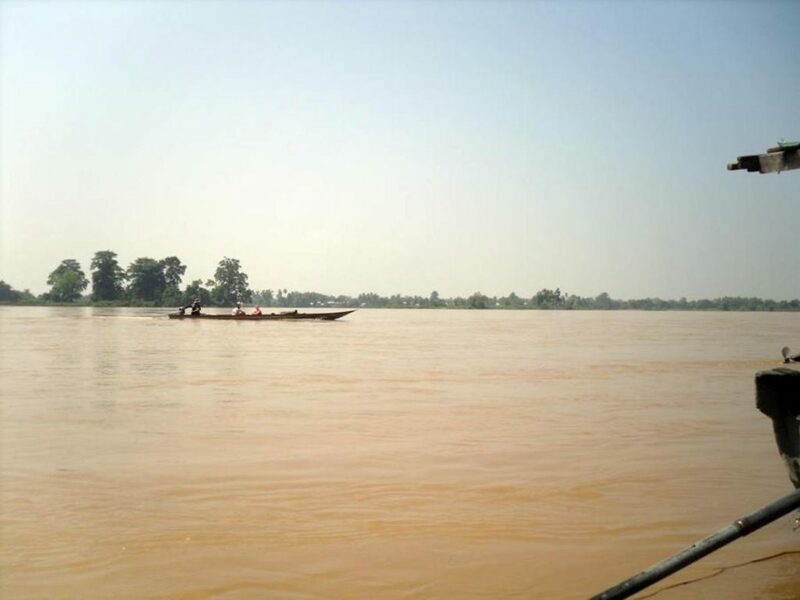 It was a beautiful day and this part of the Mekong was surprisingly beautiful, despite the brown colour of the water. We thought that it was a bit like a poor man’s Halong Bay! 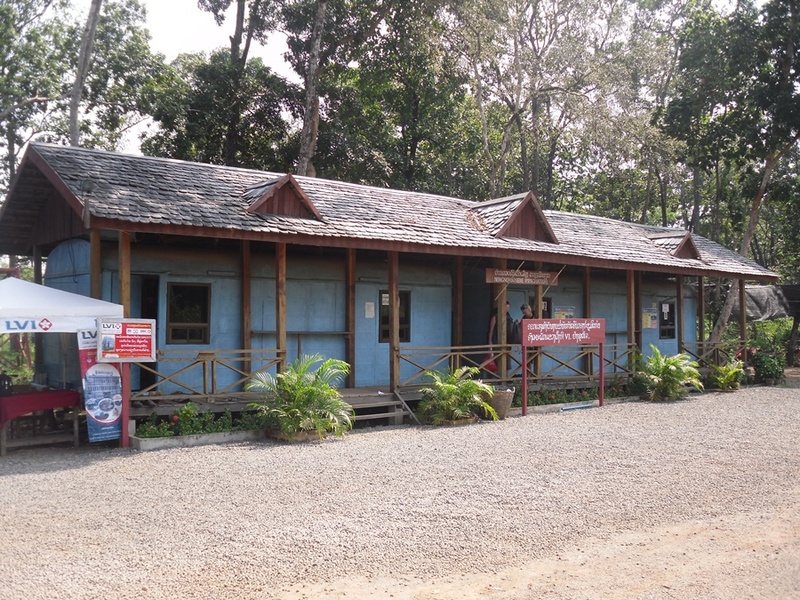 Soon we reached our final destination on Don Khon – completing our overland trip to Laos! We were so glad that we had done it in the uncomfortable, convoluted way that we did as the whole trip here will now be unforgettable! Plus, the whole trip actually only cost 24$ each, including the overnight stay in Kratie – a bargain for what we got out of it. This, to us, completely proved our point about going local and experiencing new things that may well bring you out of your comfort zone, but are completely worth it! Amsterdam + Halong Bay = Vang Vieng! 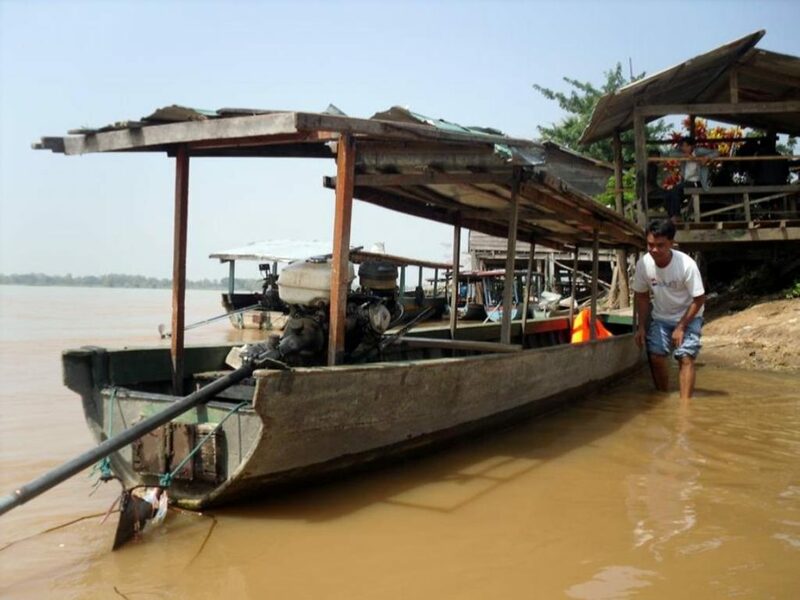 ‘Sabaidee’ to Laos from 4000 Islands!